As it’s my birthday here’s a post about parties and storytelling. It’s a familiar scene. You’re at a party, someone comes over to talk to you. You politely enquire what they do and they launch into a story about themselves. All too late do you realise that the story is dull and that you’ve been trapped by the biggest bore at the party. If not the entire world. Your eyes glaze over, your smile freezes and you long to escape and barricade yourself in the nearest bathroom with a bottle of gin. But you don’t. You stick it out until the story’s bitter end. 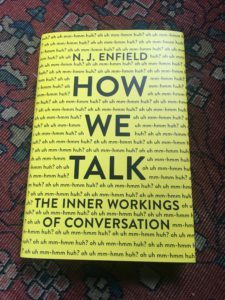 According to a new book by Sydney University Linguistics Professor N. J. Enfield, part of the answer lies in the fact that conversation has unwritten rules that go beyond those of simple politeness. This is because conversation, that most human of activities, is a mechanism for social cohesion. And storytelling in particular, is the way we share, evaluate and appraise common experiences. But for the mechanism to work it also comes with a set of expectations and obligations for storyteller and listener alike. In the case of the narrator there is the expectation that they won’t launch into a War and Peace length oration that crowds everyone else out of the conversation. But for the listener, the rules seem to be firmer. By introducing a story or example, the narrator is marking out time for his or herself in order for the narrative to unfold and the social bonds to be strengthened. In other words, if you are telling a story, there’s a very good chance you will be allowed to finish it unless you are talking to someone who is so rude, or knows you so well, that they have no issue with cutting you off and looking like a jerk. So, what does this mean for people working in business negotiation, advocacy, or other professions that require you to make the most of your speaking time at face to face meetings or events? Well, unsurprisingly, it means that they should be telling more stories, particularly if there is a difficult or technical issue to explain. 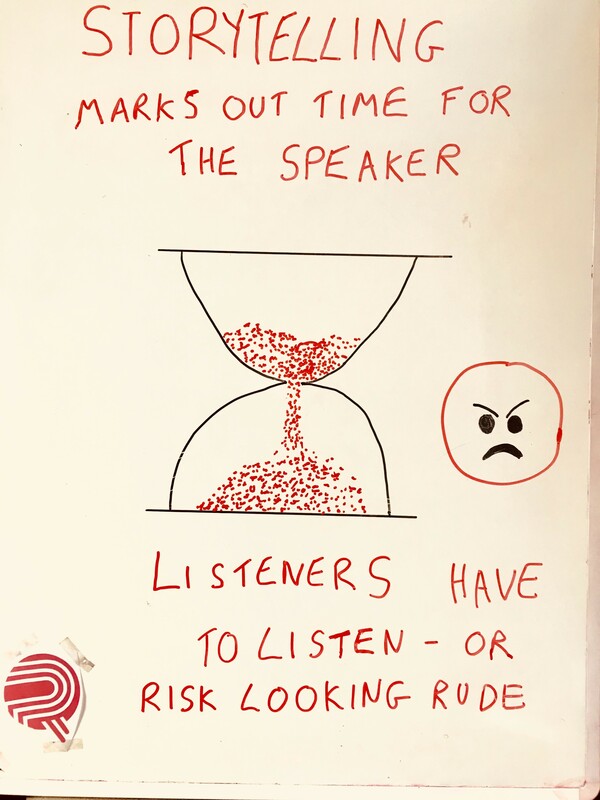 Not only do stories simplify and humanise complex issues but they also demarcate that time as uninterruptable space that the listener tacitly agrees to respect. And this is an invaluable asset to have up one’s sleeve if there is a need to persuade an MEP, a live panel audience or a sceptical journalist in a very short amount of time. So, to communications and public affairs professionals still struggling to persuade colleagues of the benefits of telling stories, perhaps this is a new tactic for you to try? Your colleagues may see stories as touchy-feely nonsense that are nice to have but not essential when it comes to the art of persuasion. But very few people will turn down a chance to have uninterrupted time to talk. Like the blog? Then why not sign up to receive it automatically at the top of the page?